We have already seen the first new smartphone which is based on Intel’s new Medfield smartphone platform, the Lenovo K800 and now we get a look at Intel’s reference design which will be used by manufacturers to develop new Atom based smartphones. 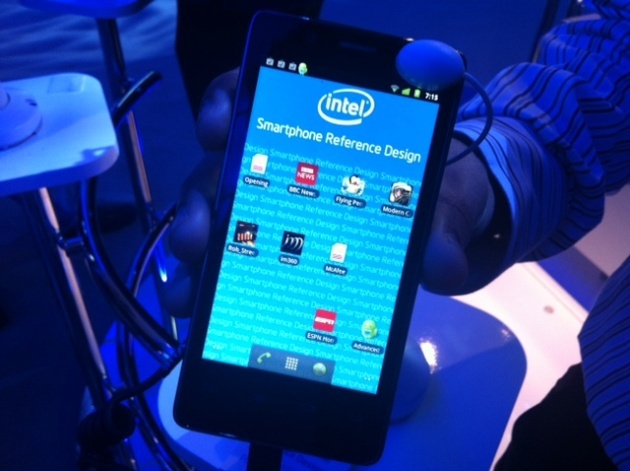 The device that Intel is showing off at CES 2012 comes with a single core 1.6GHz Intel Atom Z2460 processor, and Intel are also using the stock version of Android 2.3 Gingerbread on the device. Other features include Intel Graphics Media Accelerator, a 4 inch touchscreen display, a rear 8 megapixel camera and a front facing 1.3 megapixel camera there is also support for NFC. Manufacturers like Motorola, who just signed a deal with Intel to produce Intel based smartphones will be using the Intel reference design as the starting point for their new smartphones.